Starting on June 10th, National School Grounds Week will celebrate the outdoor areas of schools and the many benefits that outdoor activities can bring to children. The event focuses on enabling school staff to deliver current curriculum objectives through outdoor activities and discover fresh approaches to learning. National School Grounds Week is a yearly event organised by the UK children's charity Learning Through Landscapes. The charity exists to promote and advocate outdoor play and learning for children, allowing them to better connect with the natural environment whilst also becoming more physically active. Young people are at the very heart of the organisation and are strongly encouraged to take an active role in deciding how their outdoor areas should be designed and improved. This involvement allows children to create something valuable to them and, as a result, they learn how to work hard and then take care of the results of this work, improving social skills, self-esteem and behaviour. Susta­ina­bility for the future, an important concern for young people, is also often focused on during National School Grounds Week activities. In order to enjoy outdoor areas to their fullest, they must be properly maintained. 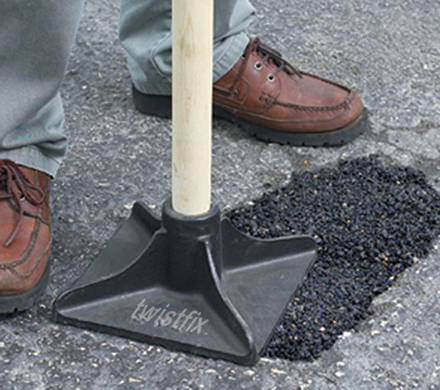 The Twistfix website features a dedicated 'Grounds Maintenance' section that provides instant access to a range of products designed to keep outdoor areas free from weeds, potholes and other damage. It is essential that playground areas are adequately maintained to ensure children can play safely. These areas will obviously be subject to heavy use and must therefore be properly treated to protect them from this use, as well as the dangers posed by natural weather conditions such as rain and the freeze/thaw cycle. Twistfix Patio Sealer is a resin-based concrete and paving sealer that offers effective protection against weather damage as its acrylic formula penetrates deeply into the surface, actively repelling oil and water and providing lasting protection along with improved aesthetic appeal. Small cracks in floor surfaces will quickly enlarge as water enters. 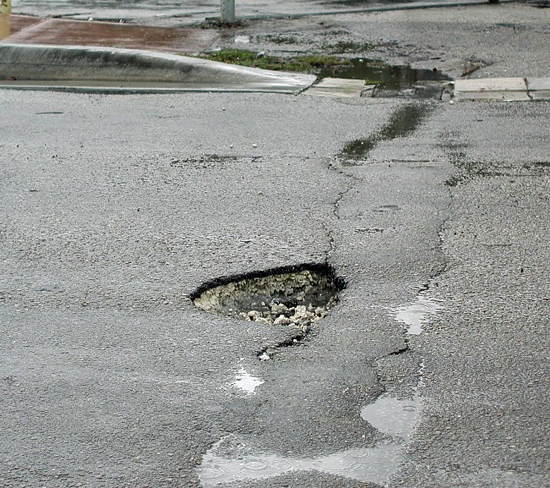 Small pieces of the surface at the edge of these cracks will gradually break up by a process of erosion, hastening the process further and eventually leading to potholes if left untreated. 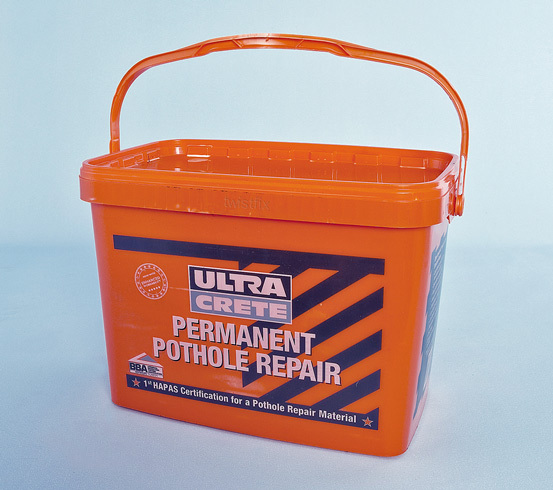 These holes pose a serious tripping hazard and should be repaired at once; Twistfix Ultra Crete Permanent Pothole Repair offers a simple and secure repair method with its graded interlocking aggregate that is of highway quality. 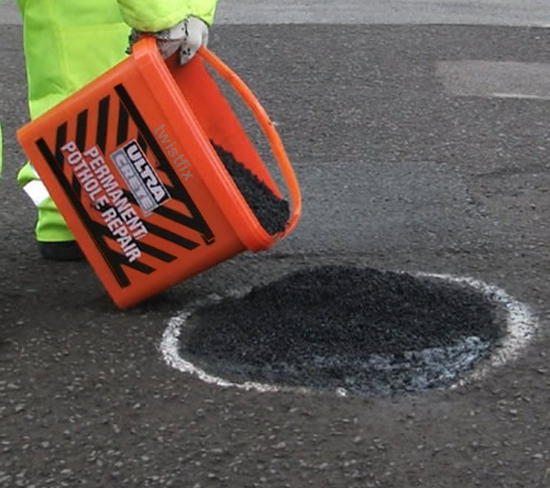 Offering an instant solution, this cold-lay asphalt is completely solvent-free and contains specially-formulated bitumen. Please enjoy browsing the 'Grounds Maintenance' section of our extensive website, which also provides access to the entire Twistfix range of masonry crack repair products. Please contact us on 0845 123 6006 or email us at sales@twistfix.co.uk for further information on Twistfix products.